The 42,891 sq. 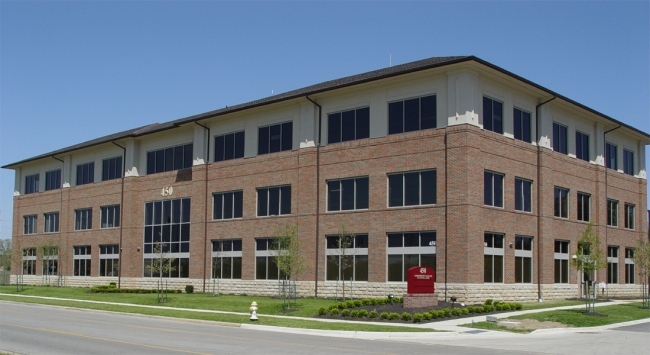 ft. three story multi-tenant professional office building designed primarily to accommodate medical or dental office/clinic related tenants and in keeping with the aesthetic corporate theme of City of Westerville, Ohio. The building has a brick veneer with the soldier course over the windows and the third story is wrapped with an EFIS system (Exterior Insulation Finish System) having an 8” EFIS cornice accent band. Aluminum curtain wall systems with bronze insulated glass and bronze spandrel glass accents the brick veneer and a metal entrance canopy is used to define the entrance. Dimensional asphalt shingles were used for the roof. The base of the building is defined with a 4”x4” chamfered cast stone band over a 4” x 8” crushed texture masonry unit.